Automate business processes with customers and suppliers. Ideal for SMEs: The it.x-EDIconnect EDI converter enables you to reliably meet the technical requirements of ultra-efficient electronic data interchange. With it.x-EDIconnect, you can communicate rapidly, securely, and efficiently with customers, forwarding companies, and suppliers. And, you can make your business processes much more effective because all data is taken directly from your ERP system. From configuration to monitoring, you can be sure that you have a reliable, secure setup – that means lower costs while enjoying higher quality and speeds. Of course, you also have access to all data formats, from EDIFACT to VDA, which means that you can implement consistent processes with your business partners. Want to take advantage of the cloud for your EDI? No problem! With our EDI Managed Services, you can enjoy seamless B2B integration and relieve the burden on your IT department at the same time. And because our experts are constantly developing the solution further, you will also be able to reliably meet any requirements that arise in the future. Thanks to it.x-EDIconnect, we enjoy the state of the art and can configure our electronic data transfers more effectively. Quick Test: Is Your Electronic Data Interchange Up to Date? Have you seamlessly integrated all business partners into your system? Do you have individual user interfaces for each area of application in departments and IT? Do you maintain an overview of each EDI process by means of functional, technical or log monitoring? Does your EDI system support all key data formats? If you have answered “no” to any of these questions, it.x-EDIconnect is an exciting proposition for you. With our solution, you can meet all the requirements for an integrated, high-performance data interchange. Easily integrate the business processes of your partners into your IT system – no matter what software the company uses. Provide departments and IT with customized user interfaces. Gain complete transparency across each EDI process through functional, technical, and log monitoring. Search EDI data based on information within the documents, create overviews of all processes in table form, and much more. EDIFACT, VDA, ODETTE, ANSI X.12 – with it.x-EDIconnect, all file formats are available to you. The ZUGFeRD standard is also easy to implement. What’s more, you have access to a wide range of mappings. The bottom line is that with this solution, you can be more competitive, because the use of EDI is often decisive when it comes to selecting suppliers. This means that you can tap into new customer segments while also strengthening existing relationships. The cloud solution is based on SAP Process Orchestration and provides the technical basis for the efficient integration of business partners. itelligence conducts operations at our own SAP data center, which is certified pursuant to ISO/IEC 20000-1:2005, taking the pressure off your IT department. As well as business partners, you can integrate other cloud solutions, for example web shops or the SAP Cloud for Sales solution. EDIFACT, VDA, ODETTE, ANSI X.12 – all common file formats are available to you. This is Paul. He has been desperately searching for a new EDI solution that has to be flexible, expandable, and future-proof. Learn how his search will finally have a happy end with it.x-EDIconnect from itelligence in our new video. Behind it.x-EDIconnect is itelligence, one of the most successful SAP consulting companies in the world with more than 30 years’ experience. More than 6,000 customers already place their trust in our solutions and services. We offer everything from a single source: Our service range extends from SAP strategy consulting and licensing through proprietary industry-specific SAP solutions to application management and hosting services. itelligence is an SAP Platinum Partner and has already received numerous SAP Pinnacle Awards, three of these this year alone: SAP Global Platinum Reseller of the Year 2018, SAP SuccessFactors Partner of the Year 2018 – Small and Midsize Companies, and SAP Partner of the Year 2018 – Database and Data Management. 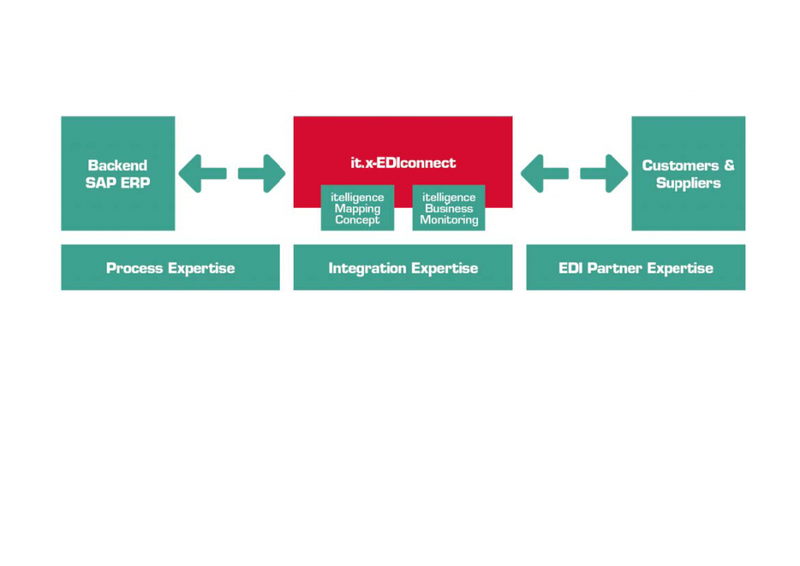 Our fact sheet provides useful information helping you to bring full transparency into your EDI and connect smoothly with your partners. Are you searching for answers or would like to receive more information on it.x-EDIconnect? Do you wish a more detailed advice from our experts?